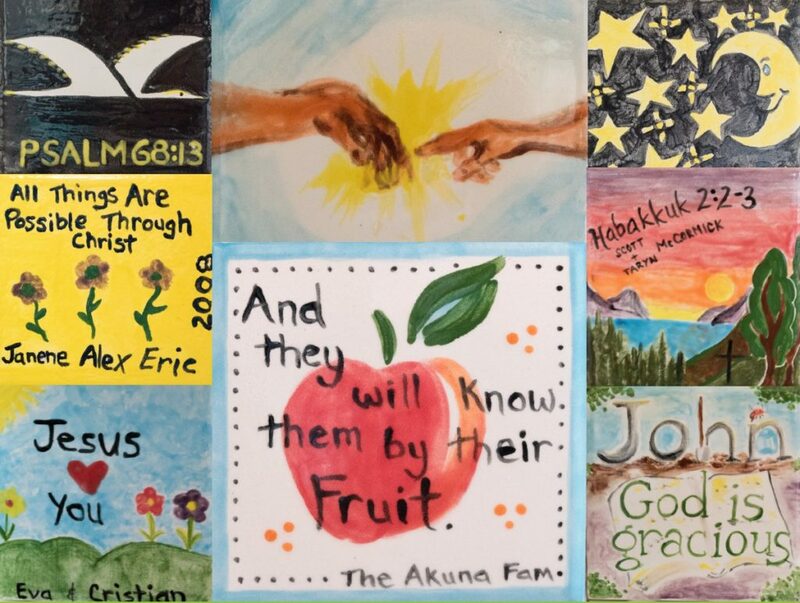 During the first year or so of our program we had a fundraiser that involved hand painted tiles. 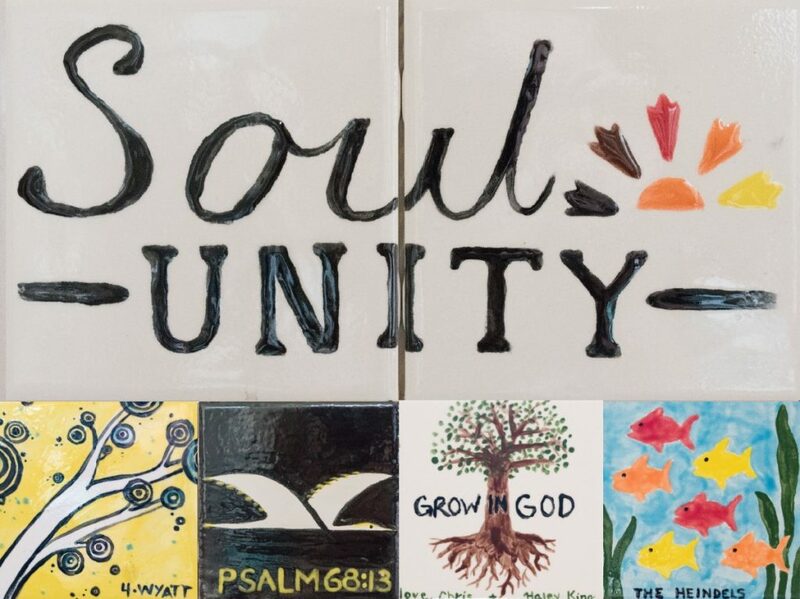 The proceeds from these tiles would fund a new playground for the Rose Hill Cottages where our foster parents were living. 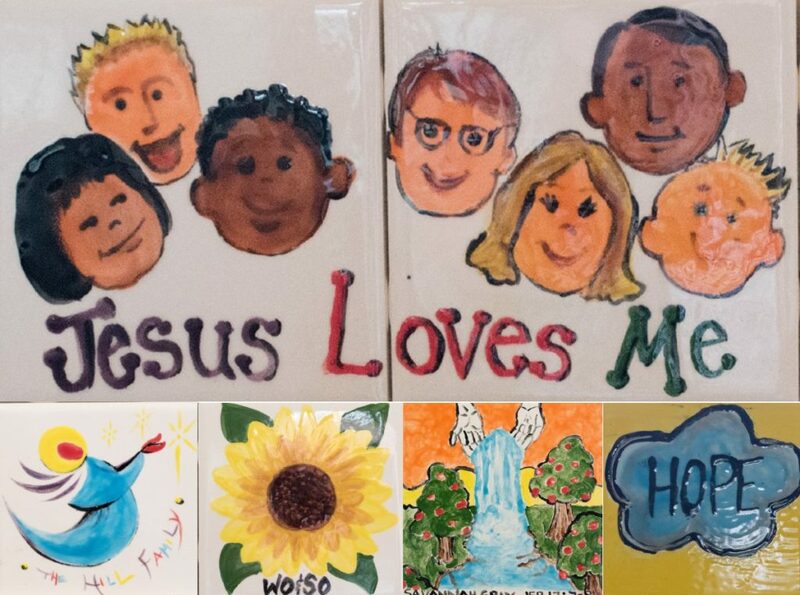 There were several artists whom painted 5 different tiles to choose from for families who just wanted their names added. 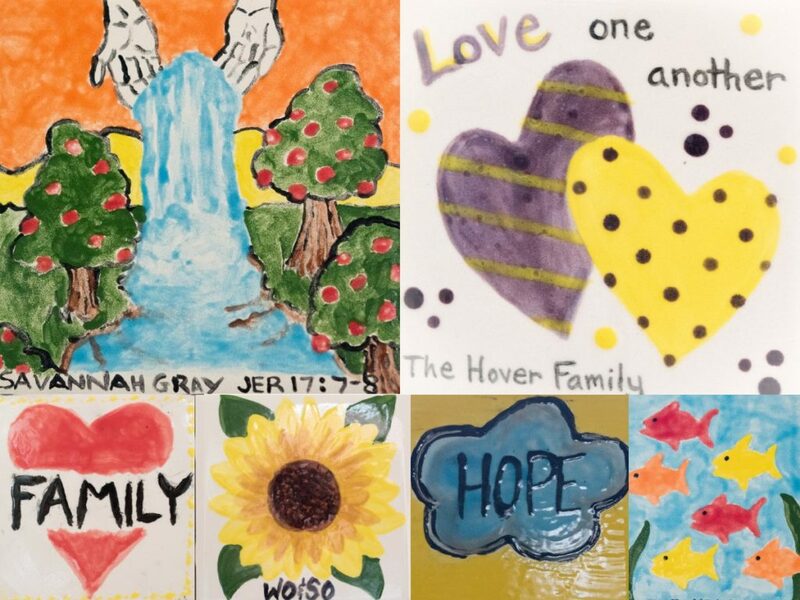 Other families chose to paint their own and even let their children make a tile. This project was very successful and allowed our community at City Church (now Churchome) to be involved in ministry to foster children by helping to build the playground. We raised over $25,000! The giving didn’t stop there, but continued with our City Ministries staff and volunteers, along with City Church Interns(now Churchome College Students) who literally dug the post holes and set the foundation posts for the playground. 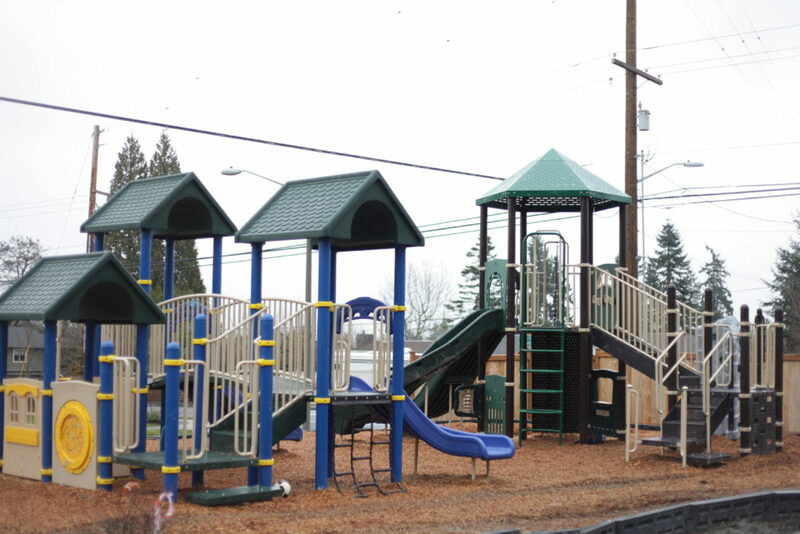 We assembled play equipment (with knowledgeable guidance of course), shoveled and installed hundreds of yards of bark, resulting in the well-used and thoroughly enjoyed play structure you see today. In the early days of our program,everyone wanted to jump in and help see the vision of serving America’s orphans(foster children) by providing safe and loving homes, support with children’s activities, themed Christmas parties and so much more. 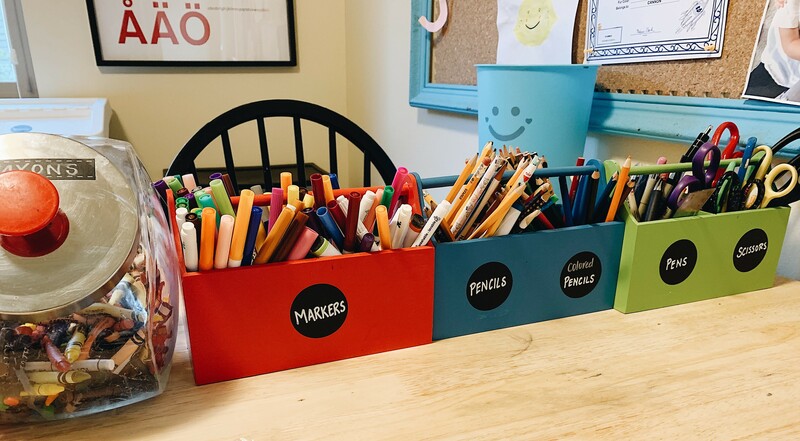 At this time in our program (year 2-3) we had a staff of 2 ½ with many volunteers that helped with visitation supervision: Mary Levering and Ammie Imae who faithfully picked up children at their foster home, transported them to visit with their parents, monitored, then took them back to their foster home. Our program could not have grown without their help or support. It was a “all hands-on deck” atmosphere of giving and serving and so very enjoyable. During the very serious situation of children being in out of home care, we found a way to pray, serve, and work hard to help every stakeholder involved. We worked hard to build positive, productive relationships with state social workers, regional licensors, visitation center personnel, CASA’s, medical professionals, biological parents and extended family and many more. This was key to serving children and helping everyone accomplish the goal of “reunification” to a safe and stable biological family. 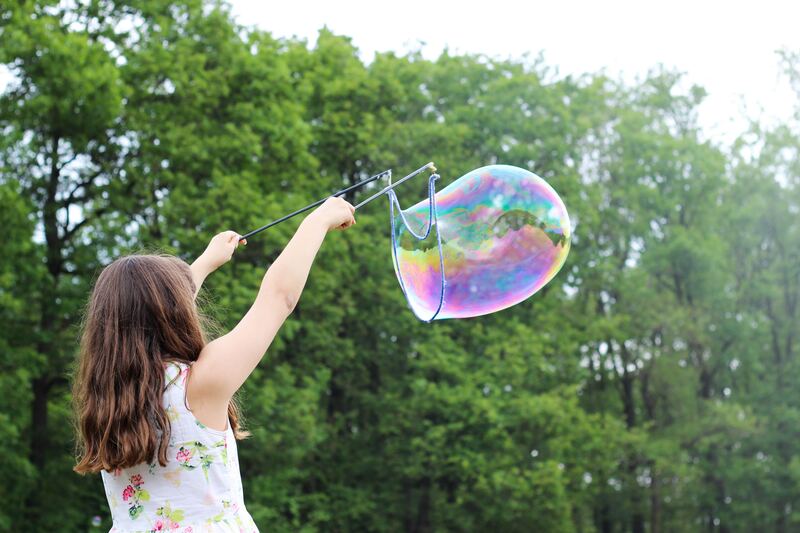 The completion of the playground and phase 2 of thecottages, enabled us to rent more homes which supports our program financially,and provide a safe place for children in the neighborhood to play. In myexperience doing visits, some of the biggest concerns of families was safetyand care for their children. Sometimeswe think children that end up in foster care come from families who “don’tcare” or “don’t love”, which is so far from the truth. These families are dealingwith a lot of issues like: poverty, addiction, mental health issues, lack offamily support and others. We come alongside and provide care for their children, while they work with the state andothers to get healthy and whole, so they can have their children returnhome. This is the focus of our prayerand advocacy. Stay tuned to more of our story in installment #4!